Females lay 2 to 7 eggs per season in March or April. Hatching occurs within 26 to 34 days. Inhabit low elevation riparian and deciduous oak woodland communities. Also inhabit streamside groves, parks, and gardens. A small owl with feathered ear tufts. Plumage is generally brown or gray. The face is usually pale with a dark lateral border, underparts are streaked and barred. They have yellow eyes and dark bills. Prior to breeding, courtship feeding is common with the male presenting food to the female. The male also demonstrates elaborate courtship displays including bowing, bill snapping, and hopping. 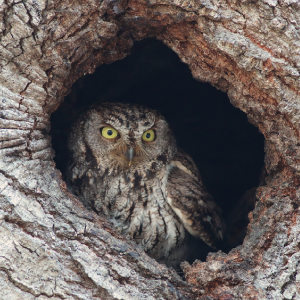 Western screech owls prefer to nest in tree cavities or nest boxes. As "sit and wait" predators, Western screech owls leave their roosts to forage just before sunset. Photo by Shravans14 [CC BY-SA 4.0 (https://creativecommons.org/licenses/by-sa/4.0)], from Wikimedia Commons. Photo has been cropped.